See scan - good condition. These medals were wartime issues and made out of a very bad metal alloy and then silvered / silver plated on top. The medal still has some remaining silver residue. 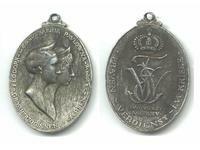 This is a very rare German Royal Saxony state / Sachen large oval medal for Military Merit and War Merit for Ladies. There are two bust portraits at obverse - of Princess Feodora of Saxony and the Grand Dutchess of Russia maria Pavlovna / Pavlowna. Very scarce and rare militaria / military collector piece and one of the rare German medals.